Monday October 12 1908 I did quite a working in the forenoon. Will was making the arrangement for digging the potatoes. We went down to Woolfs for the afternoon Will was helping with some [illegible]. We did the evening work and to bed early Ida and Mrs Shultz went home today. 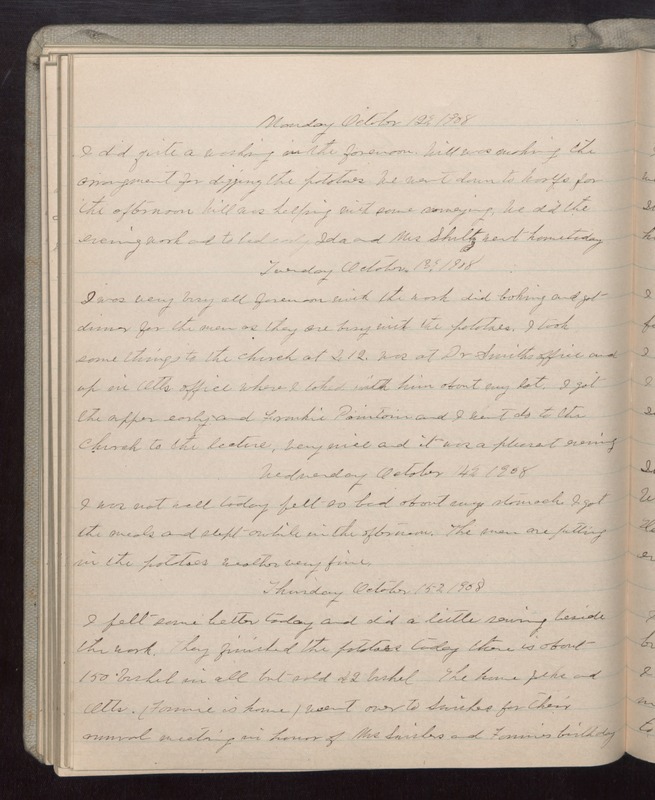 Tuesday October 18 1908 I was very busy all forenoon with the work did baking and got dinner for the men as they are busy with the potatoes. I took some things to the church at 2.12. Was at Dr Smiths office and up in Otts office where I talked with him about my lot. I got the supper early and Frankie [Pointoin?] and I went do to the church to the lecture. Very nice and it was a pleasant evening. Wednesday October 4 1908 I was not well today felt so bad about my stomach. I got the meals and slept awhile in the afternoon. The men are putting in the potatoes Weather very fine. Thursday October 15 1908 I felt some better today and did a little sewing beside the work. They finished the potatoes today there is about 150 bushel in all but sold 42 bushel. The home folks and Otts (Fannie is home) went over to Swishers for their annual meeting in honor of Mrs Swishers and Fannies birthday.